Posted on June 28, 2012, in Uncategorized and tagged Children, Daily Mail, Drawing, Family, Humour, Illustration, Pen and Ink, Sketchbook. Bookmark the permalink. 47 Comments. Fantastic! Congratulations. This is a brilliant thing you do for your family. Wonderful stuff. I live with a 10, 6 and 3 year old octopus. I AM NOT ALONE!!!! pmsl! I wish I had eight arms, I’d be landed! Yes, indeed, seen you in the mail! You’ll be getting loads of followers now! Congrats! Yay! Have just discovered you via a friend’s link to the paper on Facebook! Love those doodles they are just fab! Congrats! I think that’s fantastic. I’m a follower now, too. I think there are tons of children’s books waiting for you to do the illustrations. Wonderful drawings, very funny and just so human (if that makes any sense, sorry, not a native English speaker). I left a comment on the Mail story suggesting that someone publishes them all in a book. You totally deserve this accolade. Thank you Viv 🙂 It is so appreciated that you have all been tuning in to see my drawings, I shall endeavour to continue! I agree with the book idea. I would definitely get a copy. Omg i love it. Priceless, thank you. Every picture in the “mail” article made me smile. You show the lighter side of parenting. This would be a fabulous book…..lovely drawings. Something to show prospective boyfriends when the girls are teenagers. 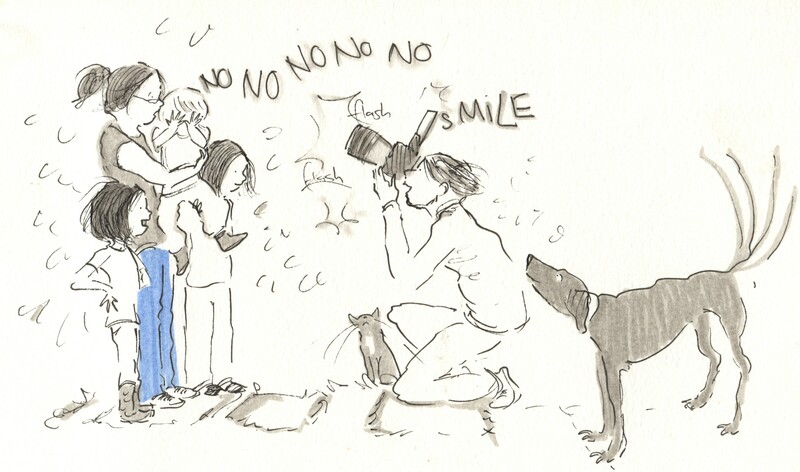 Brilliant!…made have a big, big smile.. love the art.. you’re famous.. books, art commissions… up there with Quentin Blake.. I never thought I would say this, but thanks DM! I love these. You remind me of a woman here in the US in the 70’s, Sandra Boynton (I think). You are on your way! Choose your agent carefully. Bon Voyage! Angie, your illustrations are stunning. They capture family life so beautifully (and bizarrely your girls look like they could be my two, and if the youngest had been a boy, we had wanted to call him Gruff too! I am a South Walian in exile in brum!). I bemoan the lack of time in my life to do the creative things I love, but 20 minutes devotion every night is nothing to find in the grand scale of things. What a wonderful legacy, you are very talented and I wish you well. Hi, spotted you in the DM. Just wanted to say your work is lovely. What a cool thing to give your children- I’m sure they’ll grow up to be creative too! Best wishes. Already Loved your Style – Saw a Tweet about you and followed to the Daily Mail Online (previously uncharted waters!) – So glad you have got this recognition – Hope it goes well for you. Just discovered your wonderful drawings in DM,they bring back glorious memories of when my three boys were little(now all in their 30’s)!!! I’m not a blog reader usually but will be looking at yours from now on,thankyou. I love these! Thank you for sharing them with the world….I have two girls and a boy aged 7, 5 and 2 respectively and your drawings really strike a chord with me. Raising them is so exhausting and lonely at times; seeing your work reminds me in a very personal way that so many others are going through these experiences along side me. Looking back on them really do bring on the joy and remind you after the fact how special those times are. About time too! The world needs to see your beautiful work to realise what its missing. Oh, I’ll be so pleased to see you get a whole new readership from the Mail. They need cheering up from all the negative stuff in there! I love ‘tuning in’ for your doodles. The chuckles I get from them make my night. Tee hee, I agree!!!!!!!!! I hope to keep you chuckling! Fantastic! Congrats on the write-up, very nice. I’ve been a subscriber to your pen and paper universe for a little while and always look forward to the next post. It’s great to see that you are getting recognized for your amazing work. Good job and thank you for sharing your wonder and insightful art with all of us. Now is your time… and richly deserved it is too and couldn’t happen to a nicer girl… shine as brightly as you can with your talents, and may great success be yours. What fabulous sketches! They’re brilliant. Inspiring illustrations, I look forward to seeing more!!! Aw thank you Alice, I like to keep it honest, was very nice having my make up done yesterday!